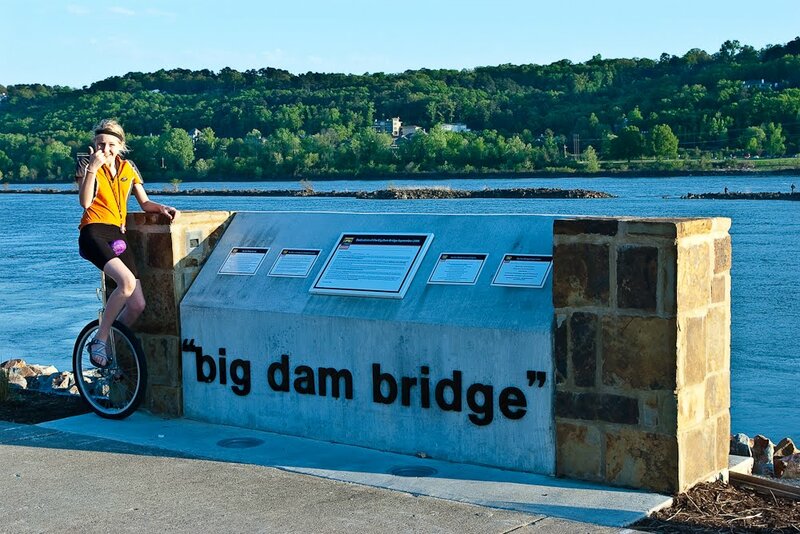 After hours of carrying rocks and digging holes, I was ready to go home, but Mandy wanted to see if she could ride the unicycle over the Big Dam Bridge. According the the BDB website, the bridge itself is about eight tenths of a mile long and the approaches are at a 5% grade. It was clear she could do it. She was strong enough to ride up the bridge, and balanced enough to steer around little kids and dogs, and controlled enough to descend without falling. In fact, she was strong enough to do all of it over and over. But she'd get the 'hard part' done and something silly would happen, like people who didn't move out of the way, or sand in her eye, or a violent apple-juice-induced coughing fit, and she'd fall. And that wasn't good enough. She was determined that she was going to do it straight, up and across and down, without dropping the uni. I can barely walk 8/10ths of a mile without tripping. 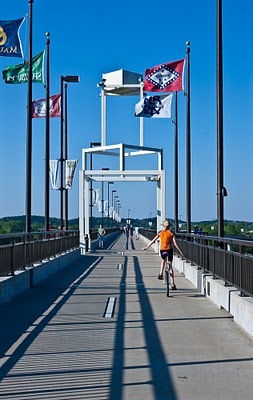 I suggest searching Youtube with the following: "unicycle gliding"
That would rock on the bridge.